Bistro keeps comforting long after your shift is done. 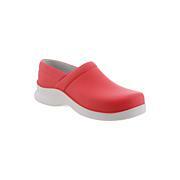 Cushioned insoles, excellent arch support and a closed heel guarantee a secure fit and all-day comfort. 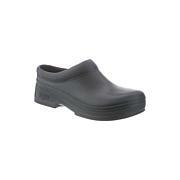 Non-slip outsoles, rated by the ASTM F489-96 standard, provide superior traction in wet and oily environments. They're also non-marking and shock absorbent, making them a great choice for work environments. The Bistro is comfort that works. If your normal shoe size is a half size, please order one half size larger for an optimal fit.